You can do a 360 video call chat via Skype with Insta360 Air! Insta360 confirmed that you can use the Insta360 Air for a 360 video chat via Skype! Meanwhile, Insta360 confirmed that the Insta360 Air can be used for 360 video call chats on Skype on your smartphone! I don’t know if the feature is immediately available on launch or a feature that will be released later through updates. I’m also still trying to find out if you can do a 360 video chat on Skype for PC as well. 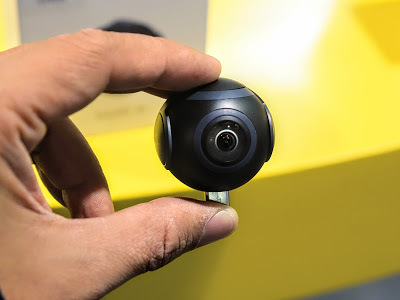 Although other cameras such as the Ricoh Theta have been used for 360 video conferencing, Insta360 Air could be the first to do so wirelessly. Insta360 Air is one of the most affordable fully spherical 360 cameras, at $119 MSRP. However, until January 26, it is still possible to get it with a 20% discount through its Indiegogo crowdfunding campaign, which it has been funded more than 1,200%. Unlike other crowdfunding campaigns which have often suffered from delays, sometimes for years, the Insta360 Air is actually shipping earlier than promised, with the first batch being shipped out in the first week of February 2017. All these features and in-camera stich capability at an unbelievable price by February three weeks away? Give me a ring and let me know how that that may go? Based on our interest in 360 immersion, this might be the sweet-spot? Did some of you get the camera to work in a a android based-skype call? I have tried to connect standard USB cameras to smartphones but have not succeed in changing to that USB-cameras within the Skype app, i do believe this is since Skype is “using” a allocated shortcut to the builtin camera-locations. Did you find out if we can do a 360 video chat on Skype for PC as well, please? I am just wondering where can I get that USB connector that doubles as a stand? What PC application do they use on a laptop PC where they had insta360 Air camera connected through USB stand for demo purposes in your video from CES 2017? Thanks. Hi Perl Post. Sorry I haven’t been able to use Air for Skype. I recommend posting to Facebook’s Insta360 Community to see if they can post instructions. But fyi, they are on a long Chinese New Year holiday. Hi Perl, did you already find out how to use the insta360 air for skype? I think Oculus Go is a good product. In the future 8K 3D 360 video may become more common. If that happens, Oculus Go probably won’t be able to play those. But there will always be 4K and 5.7K consumer cameras and the Go should be able to view videos from those cameras.